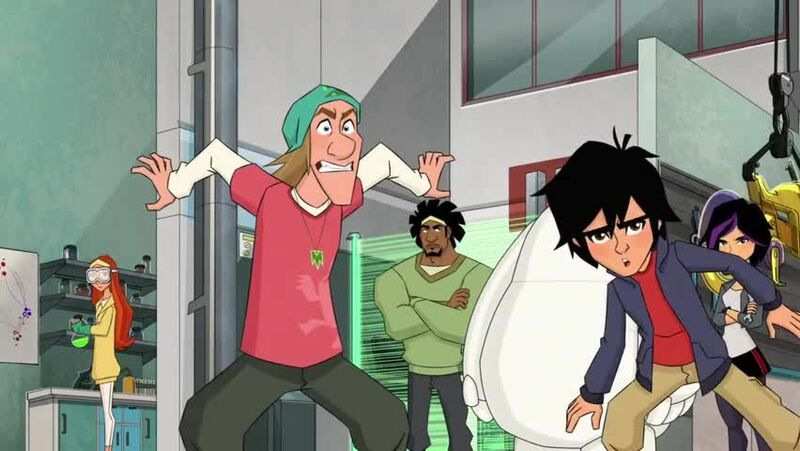 Watch full Big Hero 6: The Series Episode 17 online full HD online. Cartoon video Big Hero 6: The Series Episode 17 online for free in HD. Due to Fred’s inability to fight crime by himself without causing damage, Hiro comes up with Mini-Max, a miniature “sidekick” to babysit Fred while the rest of the team are in class. Mini-Max ends up being successful, but Fred begins to over-rely on him. Meanwhile, Hiro begins following Granville when he becomes suspicious of her past. He visits a remorseful Callaghan in prison who reveals that Granville was involved in an accident at SFIT many years ago. Hiro runs into Granville at night and she shows him her new security system which is taken over by Obake. Granville explains that she had a student whom she trusted too much and he ended up in an accident that she took the blame for. Fred and Mini-Max come and rescue the two with Fred tricking the system into destroying itself. Afterwards, Hiro and Granville begin trusting each other more.